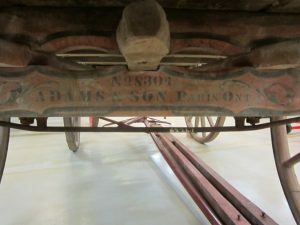 When Peter Adams started his wagon building company in Paris, Ontario in 1863, designs were very basic and relatively simple from an engineering point of view. 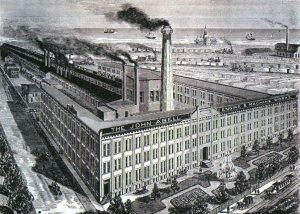 Demand was such that hundreds were shipped from Paris to Winnipeg in a season and soon Adams was building a new factory to increase production. His wagons were well built and were worked hard by the farmers who purchased them. But farmers were renowned for ignoring the load limits of their equipment. If the wagon could carry it, it was loaded on for shipment. The results were inevitable – a considerable number of broken axles, despite the fact that the axle beams were 6” x 4” hardwood section. By the mid 1800’s, Peter had solved his problem with a relatively sophisticated (for the day) engineered solution, one that had so far only been used primarily on bridge truss construction. A length of half inch diameter round steel bar, threaded both ends, was installed under the axle beam resting against two cast iron supports. The two ends were bent up slightly and the bar ends passed through the centre of the cast iron skein bearings as they were installed on the beam ends. A nut was installed on each end of the bar and tightened to apply tension to the bar. This truss took any weight that deflected the wood beam, and had the effect of doubling the strength and carrying capability of the axle beam. Peter Adam’s problems with axle breakage from customer overload became a thing of the past. And, despite Adam’s having patented this design, it was soon a feature that many competitors tried to copy with varying degrees of success. 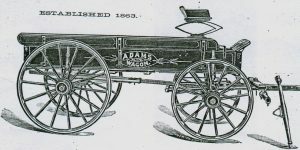 In 1847, after working in a wagon shop in Woodbridge for a couple of years, young English immigrant, John Abell was keen to have his own business. After building his own shop from logs, making his own lathe and tools, he then made himself a steam engine for power and was in business. With an inventive mind, he built a ditching machine for the local farmers and soon was building steam engines for sale. In keeping with his thinking, his first steam engines for sale were an unusual design. 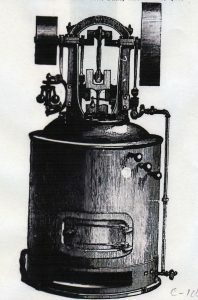 The cylinder and piston were built inside the boiler, with the crankshaft and flywheel above the boiler. His rationale? With the cylinder inside the boiler, all the parts could expand at the same rate maintaining the tolerances for better operation. Admittedly, it was not a big engine, but he advanced from there and within twenty years had over 100 employees making threshers and reapers as well. After unsuccessfully fighting with the local railroad for better access and service for shipping of his products, he closed his factory after forty years in Woodbridge and moved the complete business to Toronto. Here, Abell built a huge new factory and was soon shipping threshers and steam traction engines all over Canada. His plowing engine was one of the largest in production in North America, and true to form, was a little different to his competitors. 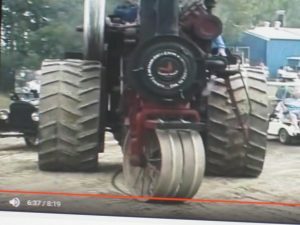 The two front wheels were mounted close together on a turntable, with a worm gear drive to steer. It proved much easier to steer than other traction engines. From small engines to huge engines, John Abell always maintained his independent thinking.